Doug Block's latest documentary 51 Birch Street poses the question, "Do we really know our parents?" and "Do we really WANT to know our parents?" When the filmmaker's mother dies suddenly, it is a shock to the entire family. But nothing compared to the stunning news that his 83 year-old father has reconnected with a former co-worker from 35 years ago and is remarrying--only three months following the death of his wife of 54 years! This sequence of events inspired Block to investigate the mystery of his parents' marriage. Using interviews and memories of family members, photographs and even his mother's old diaries, he creates an intimate and evocative portrait of the inner workings of a typical American family. How well do we really know the people we've spent our lives with? Block searches for answers and takes the audience on this very personal--yet wholly universal journey. Doug Block is sort of a one-man show when it comes to his documentaries--producer, director, writer and even cameraman. His first film, THE HECK WITH HOLLYWOOD!, explored the trials and tribulations of three first-time independent filmmakers, and his second feature, the Emmy-nominated Home Page, chronicled the lives of several pioneers of personal expression on the internet. . Block is also the founder of The D-Word, a worldwide online community of documentary professionals. 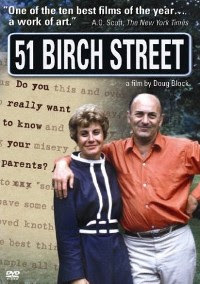 51 Birch Street was released on DVD on August 14th and is available at Amazon.com. The story of the Block family is complex and contemplative, introspective and self-reflective. It is also completely engrossing and profoundly affecting as it resonates with the familiarity of every family.